As you likely have heard me say before, perhaps in these exact words, my experience has been that successful investing is goal-focused and planning-driven, while most failed investing I’ve observed was market-focused and performance driven. My clients are working on multi-decade and even multigenerational plans for such great goals as retirement, education, and legacy. Current events in the economy and markets provide only distractions to their long-term focus. For this reason, I do not alter our investment approach given today’s or tomorrow’s headlines, but instead align portfolios with your long-term goals and risk tolerance. 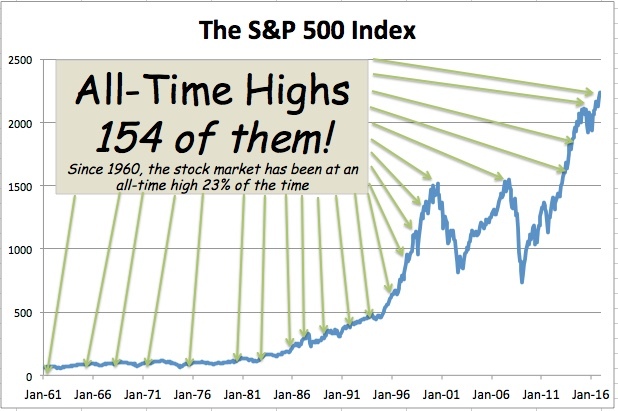 Going back to 1980, the average annual intra-year decline of the stock market has been greater than 14 percent. However, even without counting dividends, annual returns have been positive in 28 of these 37 years and the S&P 500 index has risen from 106 at the beginning of 1980 to 2,239 at the end of 2016. The great lesson here is that - historically, at least – temporary market declines have been very different from permanent loss of capital and the most effective antidote to volatility has simply been the passage of time. However, I can’t predict it will always work out this way. I can only fall back on the great investor John Templeton who said that among the four most dangerous words in investing are “it’s different this time.” Those words have destroyed many investors who bailed out at the market bottoms. - The year began with what was described as the worst first six weeks in stock market history. The S&P 500 dropped more than 11 percent from its 2015 close through February 11. In June, the market feel nearly 6 percent in a day and a half following the Brexit vote, and there was a moment somewhere around 11:00 pm after the presidential election when the Dow Jones futures were down 800 points! - The greatest uncertainty faced by the market in the last third of the year was certainly the presidential election. In fact, the pall of uncertainty was so heavy that the S&P 500 closed at lower and lower levels for 9 straight trading days – something it hadn’t done since 1980. Perhaps the biggest takeaway from the market’s initial bounce once the result was known was simply the reduction of uncertainty. - Additionally, it is not a political or partisan observation but a simple statement of fact that the incoming presidential administration, enjoying solid majorities in both houses of Congress, is likely to pursue more pro-business, pro-capital, pro-growth policies than the other candidate might have. Perhaps the market is discounting some of these actions already. What does all this mean for the future? Well, you wouldn’t expect me to predict how markets will behave in 2017, or even perhaps over the next 3-5 years, I hope. But we can say with confidence that our investment thesis of continued growth in economic activity that gets translated to corporate profits and then to our portfolio strategy over a long time horizon remains intact. Here’s wishing you and yours a very happy and prosperous 2017!